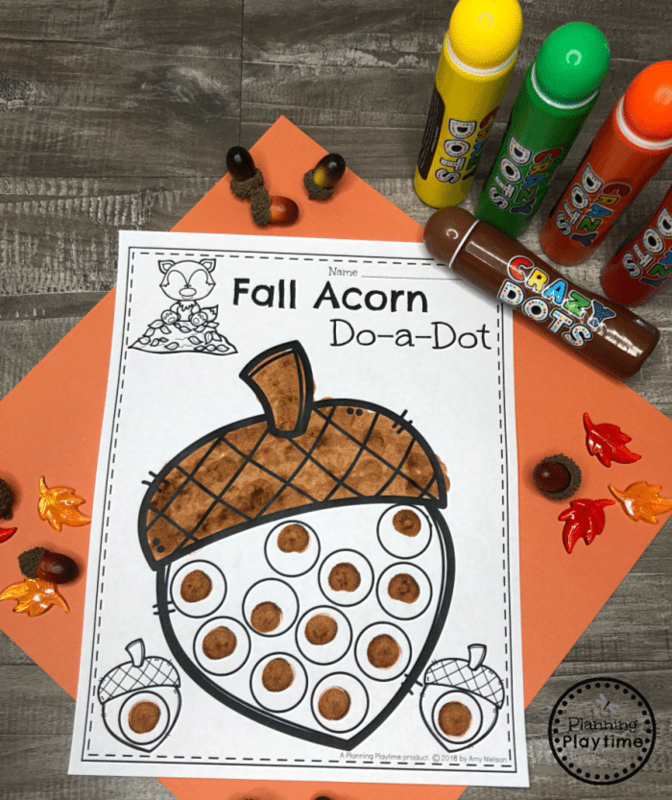 Do you need some Adorable Fall Coloring Pages for kids? 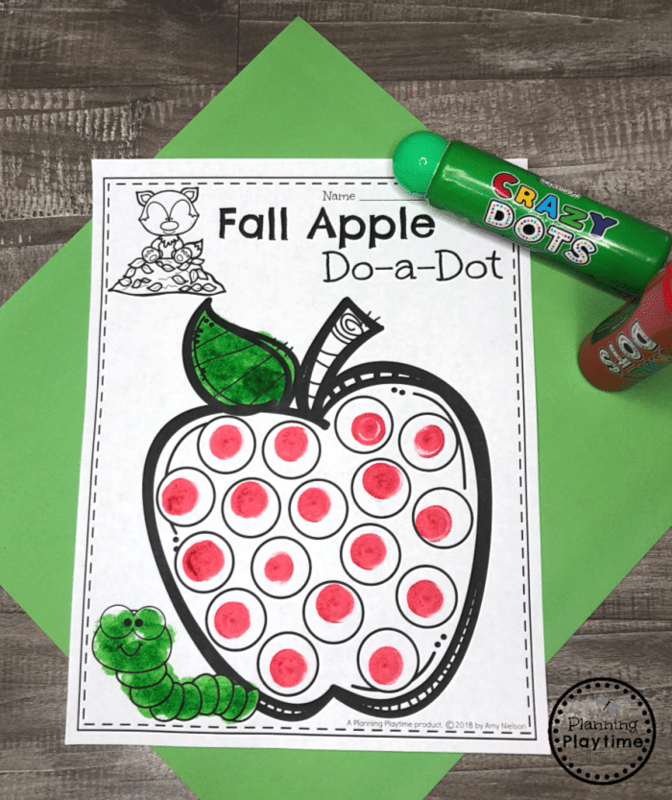 These Do-a-Dot coloring pages are a perfect art activity for kids this fall. 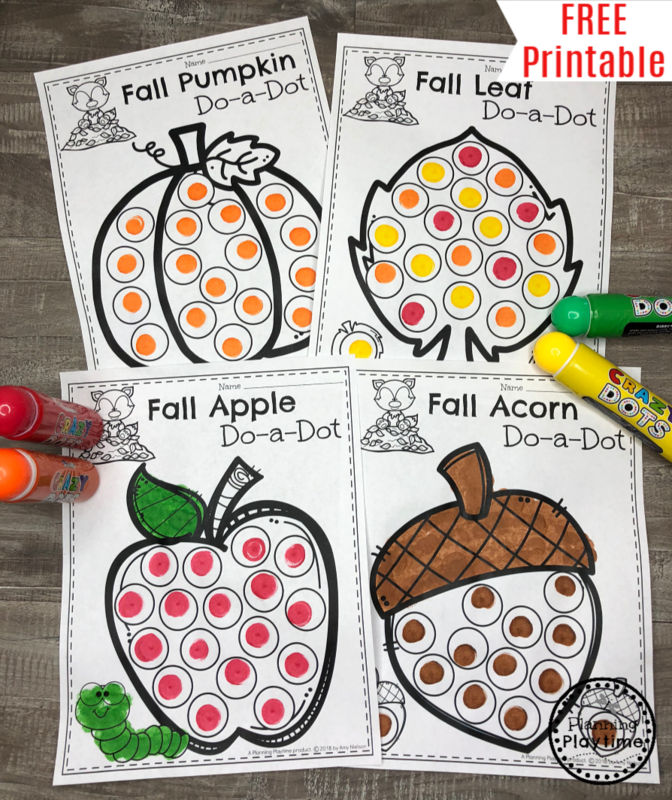 Do-a-dot coloring pages are great for kids, because in addition to all of the fun coloring, the kids are also working on fine motor skills. This is helpful for toddlers, preschoolers and even into kindergarten. There are a couple of different options for using these fall coloring pages. 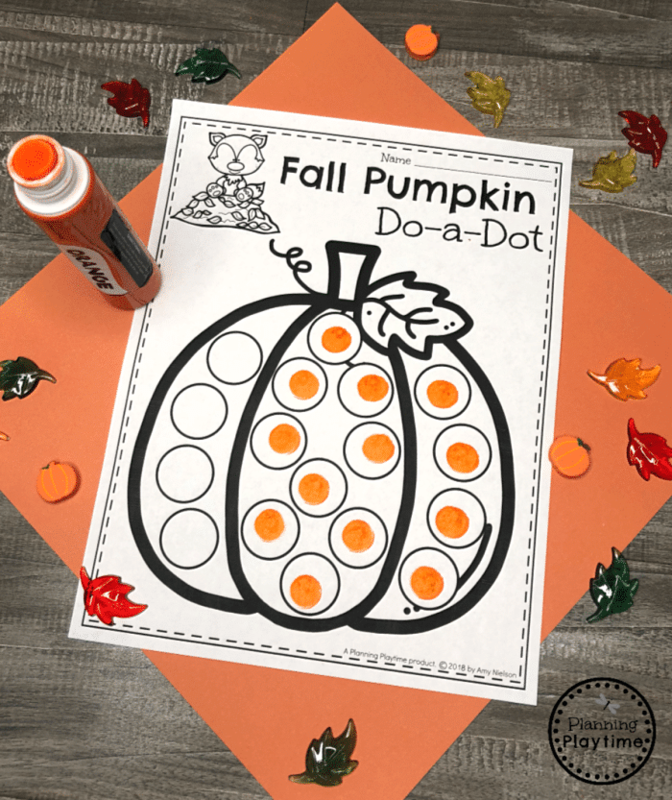 Dot Markers – Dot markers, or Bingo Daubers are a kid favorite. They love pushing the marker down to dab the color. The fine motor practice comes in as the kids line up their marker tip with each circle on the coloring page. You can also overlap your dabs to fill in a space with color. Foam Circle Paintbrushes – This is another great way to get some fine motor practice, and you can use paint for your fall coloring pages. The circle top foam brushes come in most paintbrush sets you can find in a craft store. Clothespin Pom Pom Brushes – Another fun option is to pinch a medium sized pom pom with a clothespin. 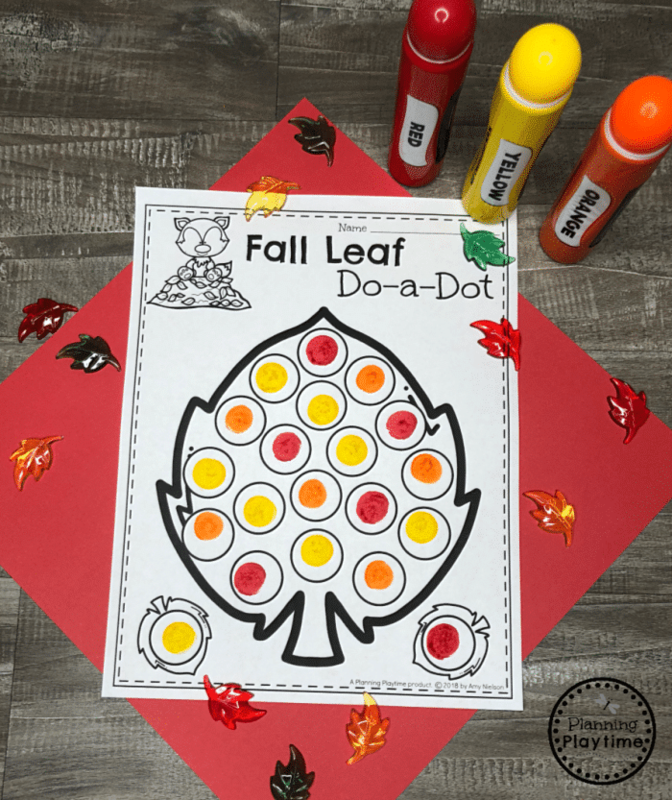 The kids can dip it in paint, and then dab the circles on ther do-a-dot page. I wanted to give you a few different styles in this coloring page freebie. You can use one at a time, as it fits with your theme, or set them all out together, to choose from, in the art center. Wish you could add an educational twist? Print out a mastercopy and write your text on it. Then make copies for your class. Turn them into a color by number by adding writing numbers in the circle and assigning each number a color. Letter Recognition – Write a focus letter, i.e. A is for Apple, in the circles. You could have one color for capital and one color for lowercase. Alternately, you could have some of the circles with a letter “A” and some with other letters. The kids can only color the circles with letter A. Roll, Count & Color – Have the children roll a dice. Count the dots and fill in that many circles. Then roll again. Continue until your picture is complete. I hope your kiddos enjoy these fun, FREE, Fall Coloring Pages. Just fill out the form below, and I’ll send them to your email. Get our latest FREEBIES, Educational Ideas and special offers. I’m sorry you’re not seeing the email. Did you check your spam or promotions folder? Sometimes they get sent there if your service provider doesn’t know we are email buddies. If that doesn’t work, you can try re-entering your email in the form to make sure it is typed correctly. The email auto-sends, so hopefully that will get it to you.